With the aACE Job Shop app, there's a better way. The aACE Job Shop app is a mobile app that can be deployed on shared iPads. 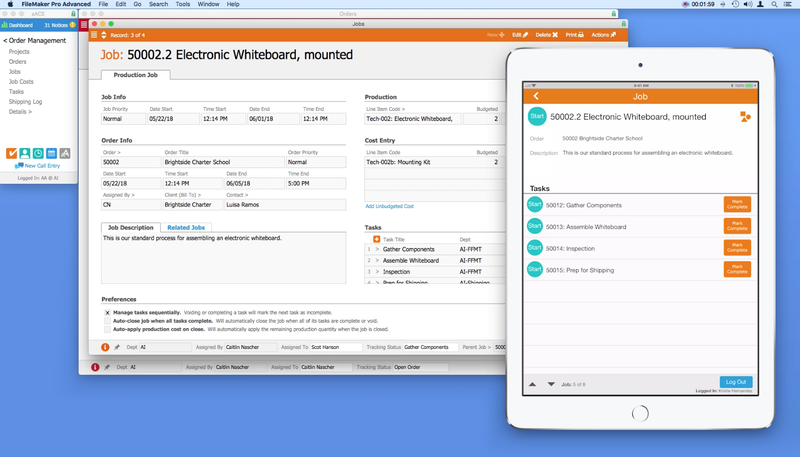 It allows your production staff to quickly log in and record time or apply materials to a job. Information from the app is passed back to aACE automatically, allowing aACE users in the office to stay apprised of what’s happening on the production floor. Now that we’ve seen the Job Shop app in action, let’s see how the fictional company aACME Education Solutions uses it in their day-to-day operations. aACME customer Brightside Charter School orders two mounted whiteboards for their classrooms. The whiteboards need to be assembled before they can be shipped. When the order is opened, aACE automatically generates a job record for the assembly. Inside the job are a series of tasks and a bill of materials. On the production floor, aACME employee Evan Phillips is ready to work. He goes to any of the shared iPads mounted on the wall throughout the site and logs into the Job Shop app by entering his unique PIN. From a list of open jobs, he chooses the Brightside Charter School whiteboard assembly. In the job’s detail view, Evan can see the order associated with the job, a description of the job, and a list of tasks that make up the job. To start a task, he simply taps that task’s Start button. The app then logs him out automatically, clearing the way for the next employee to log in. The first task in the whiteboard assembly job is to gather materials. When Evan has finished collecting the components needed for the whiteboard, he logs back into the app. To enter the parts in the job record, he taps the Apply Materials icon. Using a barcode scanner connected to the iPad, he quickly scans in each of the required materials. The Job Shop app pushes that information back to the central aACE solution, automatically updating the job record with the materials applied. After Evan is finished with a task, he logs in and taps the Mark Complete button. The task is also marked complete in aACE. Now he can see that the next task, Assemble Whiteboard, is ready to start. Back in the office, Account Manager Mara Harvey gets a call from her contact at Brightside Charter School asking for a status update on the whiteboards. With just a few clicks, Mara can see that the job has been started, the materials have been applied, and assembly is currently underway. At the end of the day, Evan submits his time by logging into the app and tapping the Timesheet button. Here he can review a list of all of the tasks he worked on today and how much time he spent on each task. He notices a mistake though – he forgot to pause a task while he went on his lunch break. The app allows Evan to record a note to his manager which will be sent along with the timesheet so that he can explain the discrepancy. Evan’s manager can review the notes in aACE, adjust the timesheet, then approve it. When the job is finished, the project manager can review the details in aACE, checking and approving the time and materials that were applied to the job. The fully-integrated, easy-to-use Job Shop app allows managers to keep track of what their teams are doing throughout the day, while also giving employees the ability to track their progress without slowing down. To learn more about this app or find out what else aACE can do for your business, contact us today. "Without much training, you can logically understand how this program fits into your work environment. The program is user friendly and easy enough for our whole staff, with varying levels of technical skills, to embrace." ~ Lili Hall, President, KNOCK Inc.